On this beautiful,autumnal and chilly morning, I decided to take a wander around Ian’s childhood stomping ground of Murrayfield in Edinburgh. Ian’s family moved from Dunfermline to Edinburgh (a distance of 18 miles) when Ian was very young. His childhood – until the age of twelve, was spent in the leafy and affluent suburb/s of Murrayfield and adjoining Roseburn - approx 2-3 miles from the centre of Edinburgh and home to the Scottish National Rugby team's stadium. At the bottom of Murrayfield Avenue sits a curious blue 'Tardis’ box. These were ‘Police Boxes’ originally installed in 1933 and used by police officers ‘on the beat’ to phone in to the station to note where they were and to get instructions on what they might do next. Ian must have passed this box and seen the local ‘Bobbies’ using them; maybe he even spoke to one of them? He did say once that he wanted to be a policeman – did this encourage him or did he just want to see what lay inside the Tardis? From the police box it's a bit of a climb until you get to Ian's old home. No 54, is in the middle of a row of villas. A handsome Victorian mid-terraced property featuring a wealth of period features with bright and spacious accommodation. I'm using estate agent (realtor) blurb because No 54 is up for sale - well at least the top half is! I'm sure that it isn't the only "handsome Victorian property" that's been divided over the years - these houses are huge. Young Ian had plenty of scope to run about. You can see the property here - remember this is only the top floor and the attic. You can buy the property if you have 'around' £595,000. On this beautiful, autumnal and chilly morning I decided to take a wander around Ian’s childhood stomping ground of Murrayfield in Edinburgh. Ian’s family moved from Dunfermline to Edinburgh, a distance of 18 miles, when Ian was very young. His childhood – until the age of twelve, was spent in the leafy and affluent suburb/s of Murrayfield and adjoining Roseburn, approx 2-3 miles from the centre of Edinburgh and home to the Scottish National Rugby team's stadium. At the bottom of Murrayfield Avenue is a curious ‘blue Tardis’ box. These were once ‘Police Boxes.’ Originally installed in 1933 and used by policemen ‘on the beat’ to phone in to the station with a note of where they were and to get instructions on what they might do next. Ian must have passed this box and seen the local ‘Bobbies’ using them; maybe he even spoke to one of them. He did say once that he wanted to be a policeman – did this encourage him, or did he just want to see what lay inside the Tardis? Just a hop and a skip away from No 54, is a lovely little park. A beautiful wooded area at the top of the road with a low stone wall and entrance. I walked through to a ‘Songs from the Wood’ atmosphere. Autumn sunshine sparkled through the trees and squirrels were scampering about. Turns out that the park is part of the grounds of Murrayfield Nursing home – a large grade A listed building hidden behind the trees. As I left the park, someone came out their house. I told him that I had just been chased from the park. He said that he sees children playing football there on occasions. Did Ian play there as a child? Was this the nursing home that Ian’s mum worked in or was that when they moved to Lytham St Anne’s? ....and a tumbling sky brewing heavy weather. I remember reading in Hit Parader (I think) magazine in the mid or late 70's, an interview or article, where it was stated that Ian had, at one time in his youth, wanted to become a policeman. I thought this was the COOLEST thing to hear, considering he was an outstanding musician (and one of my favorites), and he had wanted to do the same job that my father was doing. Little did I know, I would become a policeman. I still get goosebumps, on occasion when I think of him as a very cool policeman. 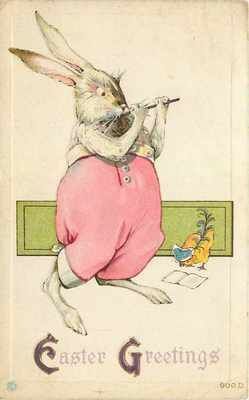 However, we all know the world is a much better place with him standing on one leg. Ian is the absolute coolest dude. You feel you have to...pray. On the other side of the road from Ian's former home, the houses are even more grandiose. Big, detached and imposing buildings which once housed one family (some might still) but are now converted into hotels or flats. I can't stress enough how elegant and 'well to do' this area is and very, very pretty. "Leaves falling red, yellow, brown.."
No wonder 'leaves' feature in his lyrics - he'd have been stamping on them all the time on the way to school or at play! A couple of yards down the road is the 120 year old, Scottish Episcopalian Church Of The Good Shepherd. Ian and his family belonged to the Episcopal faith. I assume then that they may have gone to this local church just across the road from his home - in his church finery;resplendent in kilt and polished shoes. Coming back down to the bottom of Murrayfield Avenue, the immediate vicinity is still quite ‘country’ despite the busy Corstorphine Road - a main route into the city centre. The Water of Leith - a river that snakes through the city, provides a haven for wildlife as well as a pleasant walk with the sound of water gushing alongside. There is a bridge to cross at this point on route to a row of shops. The Scottish Gallery of Modern Art is only a fifteen-minute walk from here too. Would young Ian have been taken there? Ian’s mother probably used this route to go for the daily provisions. In those days the shops would have been butchers, bakers – no supermarkets. Nowadays it’s coffee shops, fast food and candle shops. This is also where you get the bus into town. Ian went to Roseburn primary school – a seven-minute walk from his house, and situated behind the row of shops - next to the rugby stadium. They would have crossed the busy road at the traffic lights. This photo shows just how close they were to the stadium (middle of pic) I don’t know of anything recorded that says if Ian was a rugby fan, but he certainly couldn’t avoid the crowds of fans on a match day! Those blocks of flats are fairly new addition to the area. The building still has the separate door entry for 'Boys' and 'Girls' that was still adhered too up until the 1960's. Finally on my visit, I noticed two traditional pubs (from the outside - honest!) situated at either corner of the row of shops in Roseburn. However the Roseburn Bar has retained - both inside and out, most of the original features of a Victorian bar built in the 1880's. The Roseburn had the 'quaint' feature of only serving women (by a hatch) in one part of the pub as they weren't allowed in the main areas. They didn't have a ladies toilet either - no need. This was probably still the circumstances in the 50's and 60's. Indeed from my memory in Glasgow - a few of theses pubs thought that it was still a good idea! Not sure if Mr Anderson - senior participated in the odd alcoholic beverage but if he did, he may have crossed the doorway of both pubs at one time. Thanks for posting this interesting info Nonrabbit. I became a huge Tull fan around 1969 but first saw the band on the Warchild tour in 1974 when I went to university in Edinburgh. That concert made me even more of a fan! I shared a flat in Corstorphine and played rugby for Edinburgh Wanderers at Murrayfield - both locations close to IA's old house. I must have passed his house for decades without realising that was where he had lived. I heard fairly recently that he lived near Murrayfield but never knew the exact location. I remember attending a concert at the the Usher Hall in Edinburgh (I think in 78) when two very well dressed older ladies sat behind us - one mentioned that she was a relative of IA's (maybe an aunt ?). A quick query regards Tull info in general. I have just had a look at the excellent Ministry of Information site which gives details of all Jethro Tull, Ian Anderson & Martin Barre concerts over the decades. I had not looked on there for ages. It seems very up to date. I just wondered if anyone knows who runs this site - whoever it is does a great job ! Bringing back some great memories Bunkerfan. 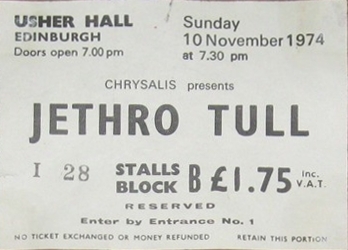 I had just started at Heriot Watt uni in Oct 74 and went to see Tull on the 2 nights they were on in the Usher Hall. It was the Warchild tour and they were supported by the all girl group Fanny who had Suzie Quatro's sister in the band. I was playing rugby on the Saturday the first concert was on and was concerned because we were playing away in the Borders somewhere. My rugby mates were saying I had no chance of seeing the concert as the bus would be stopping to drop various people off and also at various pubs on the way back. Fortunately for me the bus broke down on route, the game got cancelled & I just got back in time to see the show start. I dragged along a Malaysian pal to the Sunday concert and he became a big fan too - still have a photo of that concert. Would have been sat very close to you too that night. I think the next time Tull played Edinburgh was 78 on the Heavy Horses tour though they did play the Glasgow Apollo in 77 (attended both concerts) - strange that we waited almost 3 years for them to come back to Scotland. 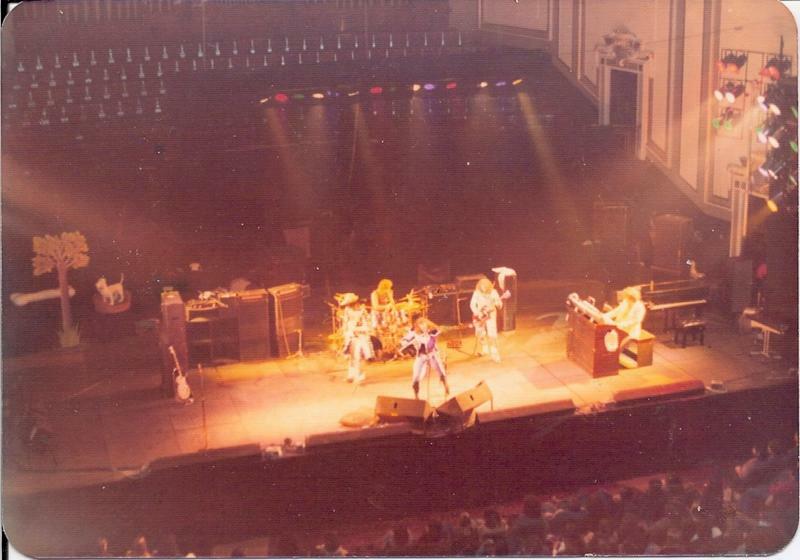 Bunkerfan, this is a photo from the Warchild concert in the Usher Hall in Nov 1974. I know it was the second show in Edinburgh as my Malaysian pal had a camera and took the photo. No idea how I still have this almost 44 year later as I can't find anything nowadays (especially if I really really need it). We were up in the "gods" in the Usher Hall though they were nothing comapred to the Glasgow Apollo. Love that image of you sitting at the concert with two well-heeled Edinburgh ladies behind you especially if they were Ian's aunties. I like Edinburgh - a lot. I love the fact that Glasgow (my home) and Edinburgh are so close. I go through every couple of months. I usually get the train to Waverley however this time I got off at Haymarket. I didn't realise how close Ian had lived to the stadium either. It was only a short walk from Haymarket to his house. I saw that concert in Glasgow. I'm going to take a trip to George Watson's were Ian went after primary school. He wouldn't have been there for very long - a year at the most but it's worth noting as well. I have a member of my family who taught there. Also Waverley station must surely have fired the imagination of a young boy and perhaps prompted his lyrics about trains. Thanks for posting the larger photo Bunkerfan. I read Nonrabbits last post about how you add photo's so will do that next time. My pal had an expensive camera when he took that - you would probably get a much better photo with an average phone nowadays. Say, how does one post photos on here? Only a truncheon was kept under the cloak - honest officer! Any problems get back to us. My dog walking on Velvet Green. Sorry, no Tull shirt here. But, I do look to outfit my daughter with a TOTRNRTYTD t-shirt with Ian giving the "Italian Salute". ....and of course, there's the mighty weathercock (to give us direction and the best of good will). Thanks brother, you should see it. Me cruising down the road popping Tull CD's in and out. Then, at a stoplight, on a warm day when everyone's windows are down......dum-dum-dum-dum!..... "You'll hear me calling in your sweet dream!"